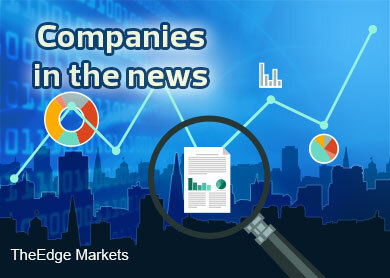 KUALA LUMPUR (Nov 24): Based on news flow and corporate announcements today, companies that may be in focus tomorrow (Nov 25) could include: Parkson Holdings Bhd, Elsoft Research Bhd, United Plantations Bhd, Barakah Offshore Petroleum Bhd, Axiata Group Bhd, Affin Holdings Bhd, and Sona Petroleum Bhd. Parkson Holdings Bhd’s net profit for the first quarter ended Sept 30, 2014 (1Q15) fell 34.1% to RM20.22 million – its lowest quarterly net profit in seven years – as segment profit from its China operations more than halved on more intensive competition. Revenue, however, came in 2.1% higher at RM848.62 million from RM831.32 million. Parkson’s China operations reported a lower operating profit of RM16.28 million from RM37.22 million in the previous corresponding quarter, on the back of negative same store sales (SSS) growth of 4% and increased operating costs. Parkson Malaysia’s operating profit also fell 9.7% to RM26.81 million from RM29.7 million in 1QFY14 on weaker consumer sentiment. Its Malaysian operations also reported a negative SSS growth of 4% in the quarter under review. Meanwhile, losses widened in its Vietnam and Myanmar operations to RM3.13 million from RM1.50 million, recording a negative SSS growth of 5% as the trading environment in Vietnam remained “challenging” amid weak discretionary retail spending and stiff competition following a significant increase of new retail players in the country. Parkson closed down 4 sen or 1.59% at RM2.48, giving it a market capitalisation of RM2.7 billion. Elsoft Research Bhd told Bursa Malaysia today that its proposed transfer from the ACE Market to the Main Market of the exchange has been approved by the Securities Commission Malaysia, vide its letter dated Nov 21. Financially, the group had achieved a cumulative net profit of RM22.38 million for the past three financial years, with net profit for the latest financial year ended Dec 31, 2013 (FY13) at RM10.8 million. Group revenue had doubled from RM12.65 million in FY11 to RM25.22 million in FY13. Elsoft, which is principally involved in research, design and development of test, burn-in and application specific embedded system, closed up 3 sen or 1.99% at RM1.54, giving it market capitalisation of RM276.95 million. United Plantations Bhd posted an 83.6% rise in net profit to RM71.69 million for the third quarter ended Sept 30, 2014 (3QFY14), from RM39.04 million in the previous corresponding quarter; revenue was at RM280.69 million, up 32.2% from RM212.35 million. For the nine months ended Sept 30, 2014 (9MFY14), net profit rose 27.7% on-year to RM205.3 million from RM160.8 million due to higher crude palm oil (CPO) and palm kernel (PK) production. Revenue was also up 17.9% to RM789.5 million from RM669.9 million in 9MFY13. It added that the better results were also attributable to PK having a significantly higher selling price as a consequence of improvement in world vegetable oil prices. United Plantations, the top loser on Bursa Malaysia today, closed down 50 sen or 2.13% at RM23, translating to a market capitalisation of RM4.78 billion. Felda Investment Corp Sdn Bhd has emerged as a major shareholder in Barakah Offshore Petroleum Bhd after having acquired a 9.73% stake or 73.5 million shares in the latter. In Barakah’s statement to the exchange today, Felda had acquired the stake via an off-market deal last Friday. This confirms a report by The Edge Financial Daily today on Felda’s acquisition of the stake, which, quoting sources, had noted that Felda's investment in Barakah would be a launching pad for the buyer to ride on the growth of the domestic oil and gas sector. Barakah closed down 3 sen or 2.22% at RM1.32, giving it a market capitalisation of RM1 billion. Axiata Group Bhd’s net profit for the third quarter ended Sept 30, 2014 (3Q14), fell 12% to RM631.03 million, from RM715.05 million. Revenue fell to RM4.65 billion from RM4.75 billion, dragged down by lower revenue contribution from its Malaysian and Indonesias units. Axiata said Malaysia’s gross revenue declined by 4.3% in the quarter, driven by decline in voice and SMS revenue, while profit after tax declined by 31% due to lower EBITDA and higher taxation. Meanwhile, Indonesia’s gross revenue fell by 4.5%, mainly due to translation impact of a weaker rupiah against the ringgit. It reported a loss after tax of RM128.4 million, due to lower EBITDA and higher depreciation and amortisation driven by Axis consolidation and weaker IDR against RM. In a statement, Axiata president and group chief executive officer Datuk Seri Jamaludin Ibrahim said he was confident to see a “turnaround” of performance in the final quarter of the year as Axiata is expected to regain customers and dealers' confidence with the company's enhanced ability to expedite launch of new products and deliver better customer service. Axiata closed up 9 sen or 1.27% at RM7.19, giving it a market capitalisation of RM61.69 billion. Affin Holdings Bhd’s net profit for the third quarter ended Sept 30, 2014 (3QFY14), declined 16.6% to RM144.3 million against RM172.97 million last year. Quarterly revenue, however, expanded 22.65% to RM937.17 million from RM764.04 million in 3QFY14. Affin has proposed an interim single-tier dividend of 15 sen per share for the financial year ending Dec 31, 2014. In a statement, Affin said its annualised after tax return on equity and return on assets stood at 7.3% and 0.9% respectively for the nine months ended Sept 30, 2014. Meanwhile, its annualised loan growth for the nine month period came in at 7.7%. As at Sept 30, the group’s gross loan and deposits ratio was maintained at 80.7%, gross impaired loan ratio remained unchanged as well at 1.91%, while net impaired loan ratio improved 3 basis points to 0.83% from 0.86% as at June 30. Affin closed down 2 sen or 0.65% at RM3.05, giving it a market capitalisation of RM5.98 billion. Sona Petroleum Bhd, a special purpose acquisition company, said it is committed to finalising the acquisition of two upstream oil and gas (O&G) assets in Thailand from UK-listed Salamander Energy plc. In a statement to Bursa Malaysia today, Sona said its commitment to finalise the purchase of effective stakes in the B8/38 and G4/50 concessions in Bualuang was despite a rival offer by UK-listed Ophir Energy plc to buy the entire share capital in Salamander. According to Sona, Ophir has proposed to acquire Salamander via a share swap. Under the exercise, Salamander shareholders will be entitled to 0.6 Ophir share for one Salamander unit held. “Sona Petroleum wishes to point out that this is a 'proposed offer' and not a 'firm offer' which has to be submitted by 24 November 2014, unless this date is extended by Salamander,” it said. Sona closed up 0.5 sen or 1.16% at 43.5 sen, giving it a market capitalisation of RM620.71 million. Tek Seng Holdings Bhd has announced a dividend payout ratio of at least 30% of the group’s net profits as its new dividend policy, with effect from the financial year ending Dec 31, 2015 (FY15). It also said it has received numerous inquiries from both local and foreign investors and fund managers, attributing it perhaps to its “stellar performance” recently. Tek Seng closed down 0.5 sen or 0.61% today at 81 sen, giving it a market capitalisation of RM194.4 million. IHH Healthcare Bhd, via its indirect 60%-owned subsidiary GHK Hospital Ltd, has awarded a construction contract for a private hospital worth HK$2.48 billion (RM1.07 billion) to Hip Hing-Chun Wo Joint Venture (HHCW). In IHH’s announcement to Bursa Malaysia, HHCW is 60%-owned by NWS Holdings Ltd, which in turn indirectly owns the remaining 40% stake in GHK. Under the contract – which has a duration of 24 months – HHCW will carry out the superstructure works comprising the design, completion and maintenance of the main contract works for the development of a private hospital in Hong Kong. The group said the contract will not have any impact on its earnings for its financial year ending Dec 31, 2014. IHH climbed 5 sen or 1.02% to close at RM4.96 today, bringing its market capitalisation to RM40.57 billion.